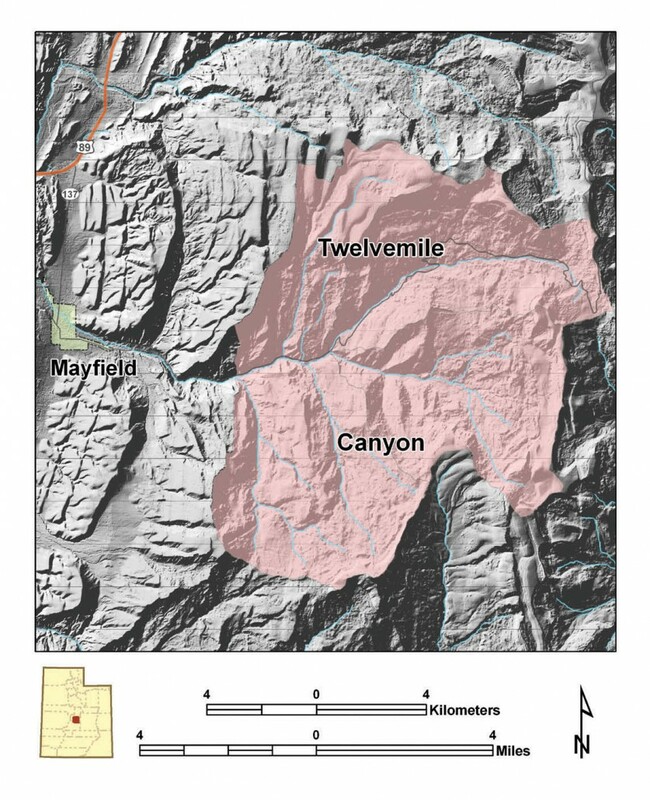 Twelvemile Canyon landslide inventory map area east of Mayfield, Utah. Twelvemile Canyon, east of Mayfield, Utah, contains large, historically active damaging landslides. Widespread landsliding in 1983 resulted in road relocations, drainage of a water reservoir, and a permanent campground closure. 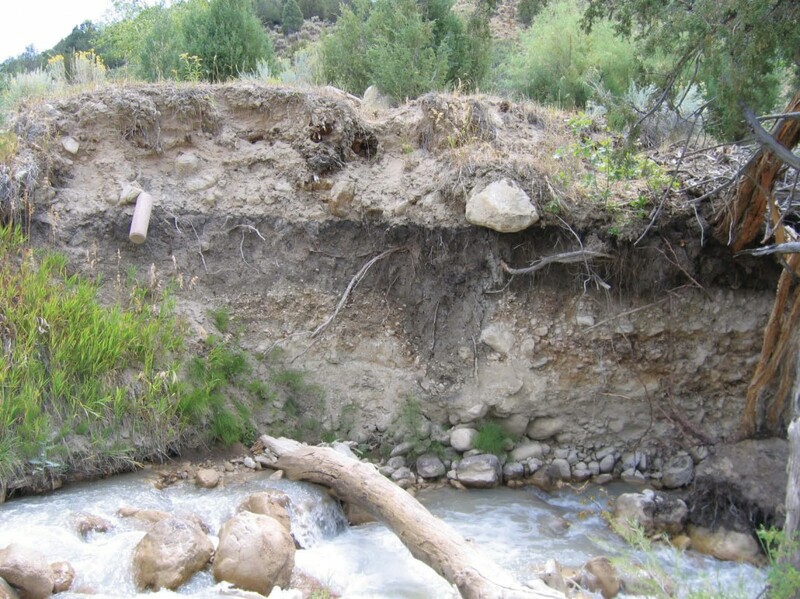 In 1998, a landslide deposited material in a creek causing a significant increase in the creek’s sediment load. 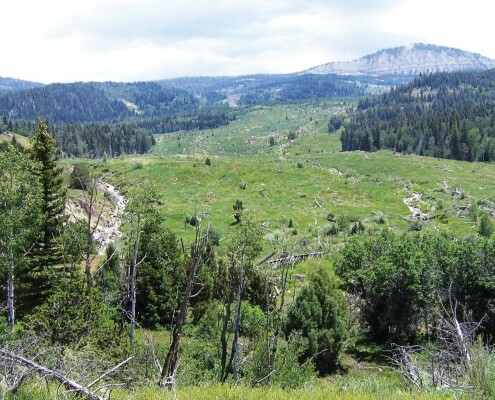 To address ongoing problems the Utah Geological Survey (UGS) and Manti-La Sal National Forest began a cooperative project in 2008 to prepare a landslide-inventory map and database of the canyon. The purpose of the map and database is to show individual landslides and their characteristics, and to provide Manti-La Sal National Forest with information to manage landslide problems. The landslide inventory map and database show landslide location and provide specific landslide information. We are using a geographic information system (GIS) to capture, store, analyze, and display the data collected for each mapped landslide. The GIS can show which landslides affect or threaten streams, reservoirs, and other features of interest. Landsliding in Twelvemile Canyon is associated with weak, landslide-prone rock, particularly the Tertiary-Cretaceous (about 65 million years old) North Horn Formation. The North Horn is composed mostly of shale that weathers to clay and produces many of the largest landslides in central Utah. The North Horn is overlain by the Tertiary Flagstaff Formation and underlain by the Cretaceous Price River Formation, both of which contain shale and produce landslides. One of the largest landslides in Twelvemile Canyon is the 1983 Twelvemile landslide which is 2.5 miles long. The Twelvemile landslide temporarily blocked a creek; when ponded water eventually overtopped the landslide dam, the rapid release of water created a debris flow (a debris flow is a rapidly moving landslide composed of water, sediment, and rock having a consistency that is similar to wet concrete). The debris flow traveled 2.4 miles down South Fork Twelvemile Creek before burying part of Pinchot Campground. The campground was permanently closed following the debris flow. Also in 1983, two other landslides were moving into Twelvemile Creek. 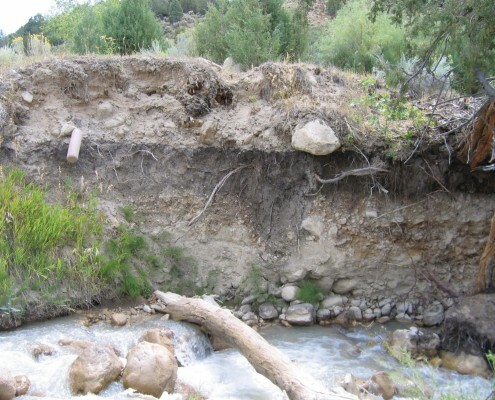 These landslides did not block the creek, but erosion of the landslides by the creek greatly increased the creek’s sediment load. In 1998 a landslide 1.2 miles long traveled downslope and collided with the 1983 Twelvemile landslide. Continued 1998 movement in this landslide caused the lower part to detach and travel 1.8 miles down South Fork Twelvemile Creek, depositing landslide material in the creek and again increasing its sediment load. In addition to these historical landslides, Twelvemile Canyon has evidence of prehistoric landslides that have blocked and deflected creeks. • confidence in mapped landslide boundaries. All landslide information is stored in a GIS database. The database can be queried to show relationships between landslides and other land-management elements such as streams, reservoirs, roads, bridges, trails, campgrounds, and timber sale areas. Our mapping shows that most of the landslides are reactivations of pre-existing landslides. Some of these landslides have moved very slowly, inches or less per year, while others have moved rapidly and traveled miles. We observed evidence that suggests at least parts of some landslides were moving slowly in 2008. 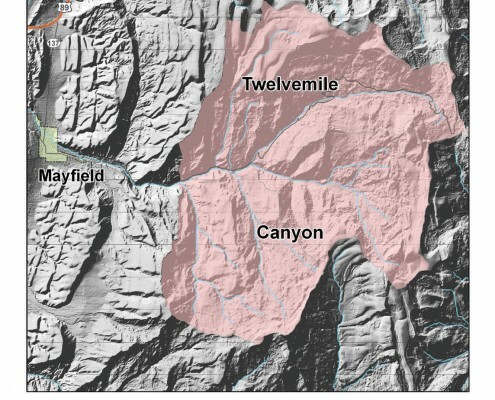 A landslide inventory is generally an initial step in managing landslide problems in a large area like Twelvemile Canyon. Since most active landslides are reactivations of existing landslides and an inventory map shows landslide locations, the map can be used to identify future potential landslide problem areas. 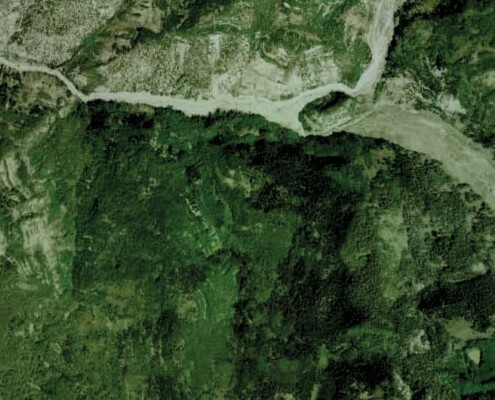 Landslide susceptibility maps and landslide risk maps can also be derived from a landslide inventory, and these derivative maps can assist in managing landslide problems. 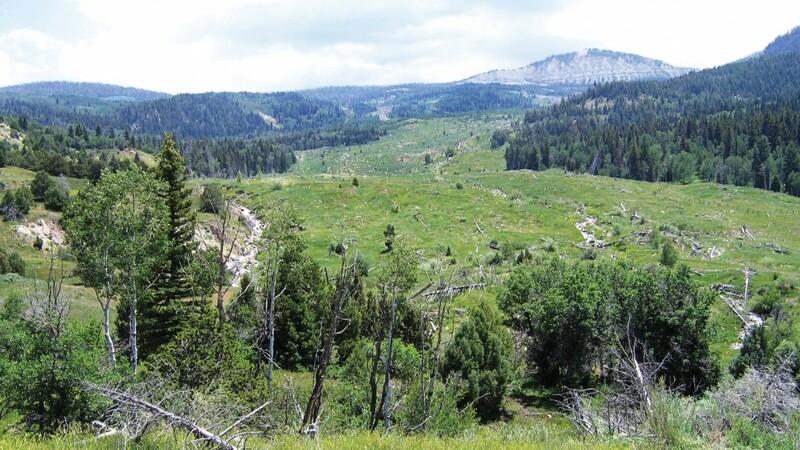 When completed, our landslide inventory will benefit Manti-La Sal National Forest in managing forest lands, downstream water users impacted by high sediment loads, and all those who use forest resources or recreate in Twelvemile Canyon.